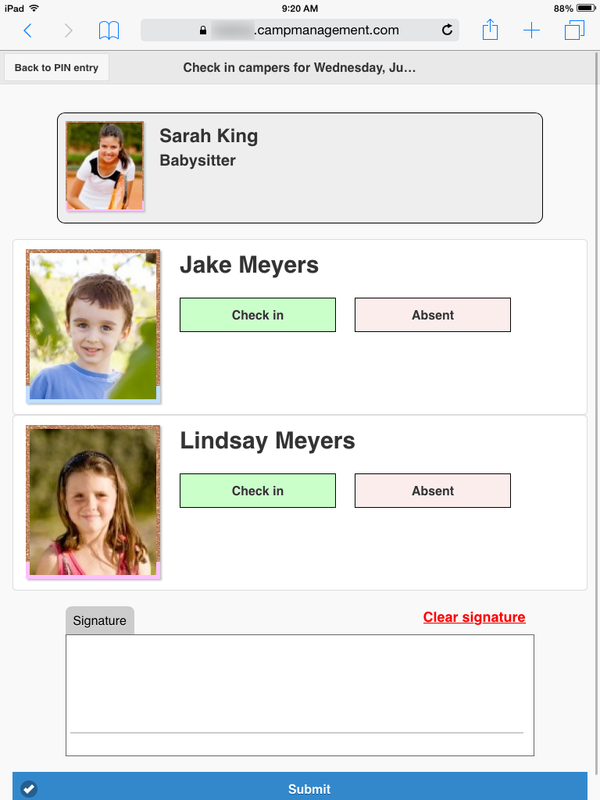 Parent-driven attendance logging allow each parent and Authorized Pickup to enter their unique PIN code in order to check campers in and out of camp. From the Attendance Dashboard, select Attendance logging (parent-driven). Next, you'll be directed to the pin page. Each primary parent and Authorized Pickup is assigned a unique six-digit PIN code for use on this screen. 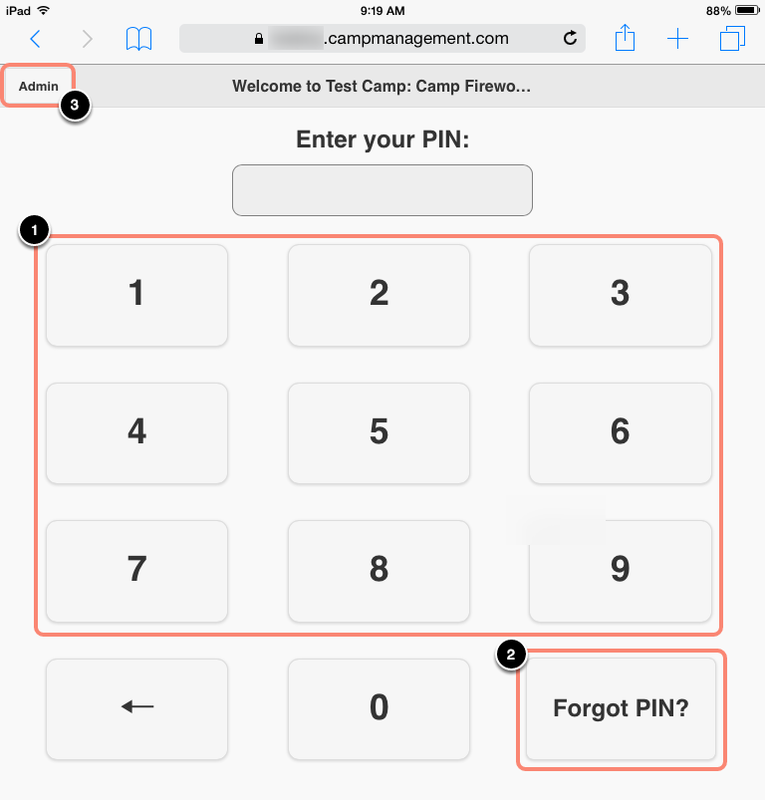 Using the number buttons, parents/Authorized Pickups will enter their PIN code to be directed to an attendance logging screen for checking in / out the campers they're associated with. Parents/Authorized Pickups can identify their PIN via the Parent Dashboard (parents' PINs are located on the "My Account" page; Authorized Pickups' PINs are located on the Authorized Pickups page, after clicking to Edit the Authorized Pickup). If a parent/Authorized Pickup has forgotten their PIN while using this screen, they may click "Forgot PIN?" to have their the PIN texted to their cellphone number immediately. To leave this page and return to the previous Attendance logging configuration page, click Admin. Please note that a password must be entered upon clicking Admin; you can set this password in the Attendance section of the Admin settings page. 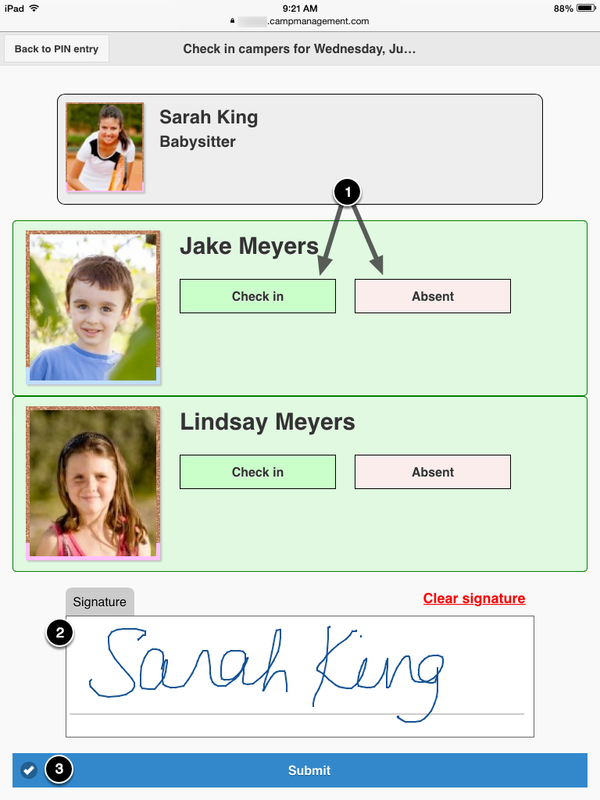 After entering their PIN, the Parent or Authorized Pickup will be directed to a screen displaying the campers within the family account they're associated with. Upon clicking submit, each camper's attendance will be logged accordingly for that particular checkpoint and direction.